Killer whales, (Orcinus orca) commonly called orcas, are found in all the world’s oceans, but the best known and most studied populations are those of the Pacific Northwest. All orcas are top predators, with complex social structures. As a species, killer whales feed on a variety of fish and marine mammals, but individual populations have become specialized to feed on particular prey species. In the Pacific Northwest one group of killer whales feeds exclusively on salmon. These are referred to as “residents” because they remain in inland or nearby coastal waters. A second group, known as “transients,” feeds only on marine mammals. Transient orcas move north and south along the coast from Southeast Alaska and British Columbia as far south as Southern California, but they frequently make forays into the Salish Sea. CA189, the orca that stranded near Dungeness Spit in 2002, was a transient killer whale. 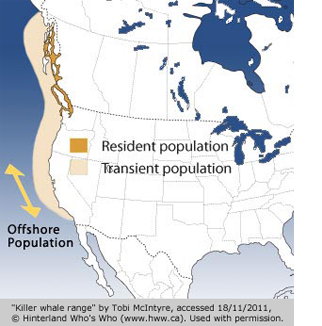 A third population, known as “offshore orcas” inhabits the water well beyond the coast. Far less is known about offshore orcas, but recent observations show that sharks are an important part of their diet. 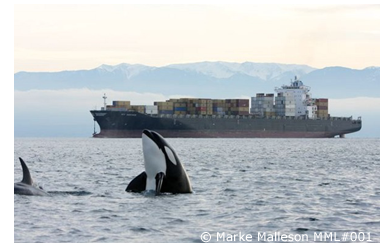 More information on offshore orcas can be found at Orca Network. Killer whales are highly intelligent predators with complex social interactions. Each population has its own “culture,” closely tied to its food source, hunting style and communication. Although residents, transients, and offshore orcas are all members of the same species, they have not been observed to interbreed. Resident killer whales inhabit the inland waters of Washington and British Columbia. There are two subgroups. Northern residents range from Vancouver Island north to SE Alaska while Southern residents occupy greater Puget Sound. Resident orcas eat only salmon -- primarily Chinook salmon -- a large, calorie-rich food source. They travel and hunt in large sociable groups of closely related individuals. Since the salmon they feed on are not very sensitive to the sounds they make, resident orcas vocalize underwater, communicating with each other frequently as they hunt. Residents have a large repertoire of unique, identifiable calls, none of which are used by transients. Their clear vocalizations and easily identifiable dorsal fins and saddle patches have made them easy for scientists to study. Resident orcas are probably the most well-researched group of orcas in the world. Transient killer whales are only occasional visitors to inland waters of Puget Sound, where they are commonly seen hunting for harbor seals. In other parts of their range transients prey on Dall's porpoises, Steller sea lions, minke whales or grey whales. Unlike resident orcas, transients travel and hunt in small groups of 2-6 individuals. These small groups are usually based on a female and her offspring, but often change as animals mature and disperse. While searching for prey, transient killer whales almost never breach or splash. They swim silently underwater for long periods, surfacing briefly to look around. They do have recognizable calls but they use them rarely, and never when hunting. Since the mammals they feed are able to hear their vocalizations, transients rely on stealth and surprise to sneak up on their prey. These features, and the fact that they are continuously on the move, make transients much harder to study than resident orcas. Orcas are a familiar sight to people living around the Salish Sea and a visual symbol of the Pacific Northwest, but orcas in US waters are facing serious threats. In 2011 the Southern resident population was estimated at just 88 individuals, down from around 200 individuals in the late 1800’s. Between 1967 and 1971, when orcas were captured for large aquarium shows, this population was diminished by another 30%, and their numbers have never recovered. In 2005 southern residents were listed as endangered under the Endangered Species Act. Northern resident and transient populations were not as seriously depleted by live capture and their numbers are not as low, however they face other serious threats. Resident orcas depend on salmon returning to rivers flowing into the Salish Sea to spawn. After years of habitat degradation, contamination and poor fisheries management, these salmon populations are also severely depleted. In 1999, Puget Sound Chinook salmon were listed as threatened under the Endangered Species Act. Some resident orcas are now traveling much farther in search of food than in the past and others are becoming malnourished when runs of Chinook salmon are poor. These signs indicate that shortage of food resources is a significant factor in declining resident orca populations. Unlike residents, transients feed on a broad range of marine mammals and are not dependent on a single food source. They also forage over much wider areas and are less vulnerable to local food shortages. Although their exact numbers are not known, most sources agree that transient populations have increased. Resident orcas spend substantial periods of time in the heavily traveled waters of Puget Sound, the Straits of Juan de Fuca and the northern Salish Sea. In addition to disturbance and occasional injuries from boat strikes, they face ever-increasing noise from boat traffic: small motorboats, regular ferry crossings, large freighters and cruise ships. Excessive vessel noise may affect their ability to echo-locate, find food and communicate with one another. Recent hydrophone research shows that orcas often have to expend more energy to communicate in noisy environments, energy that might otherwise be used for hunting and traveling. Both transient and resident orcas are impacted as they acquire and retain persistent organic pollutants through the foods they eat. These chemicals, which include PCBs, DDT and other pesticides, have been released into the environment where they accumulate in the tissues of marine life. Even compounds that have been banned for decades are turning up in very high concentrations in orcas, making them some of the most contaminated of all marine organisms. The scientists investigating the death of CA189 (Hope) were surprised to discover that her PCB levels were among the highest ever recorded. To learn more about contaminant loads in transient orcas and how this orca might have acquired these chemicals go to Contaminants in Orcas.